PRO-CURE SCENT... AN UNFAIR ADVANTAGE? Fishing has always been a favourite pastime for many families throughout Australia, with everlasting memories of significant catches and tales of the one that got away fuelling the fire for future adventures! Nothing beats leaning back on a fully loaded rod as you watch it bend over from the weight of a newly hooked fish. Not knowing what is on the end of your line can be just as exciting as slipping a landing net under your prize catch! I always cast my mind back to when I was a young boy, catching whiting, bream and flathead with my family over the school holidays, using freshly pumped yabbies or prawns that we had caught in the bait net the previous day. We never used lures and rarely saw anyone use them. In fact I remember thinking, why would a fish eat a small piece of plastic over well presented live bait? How wrong I was! 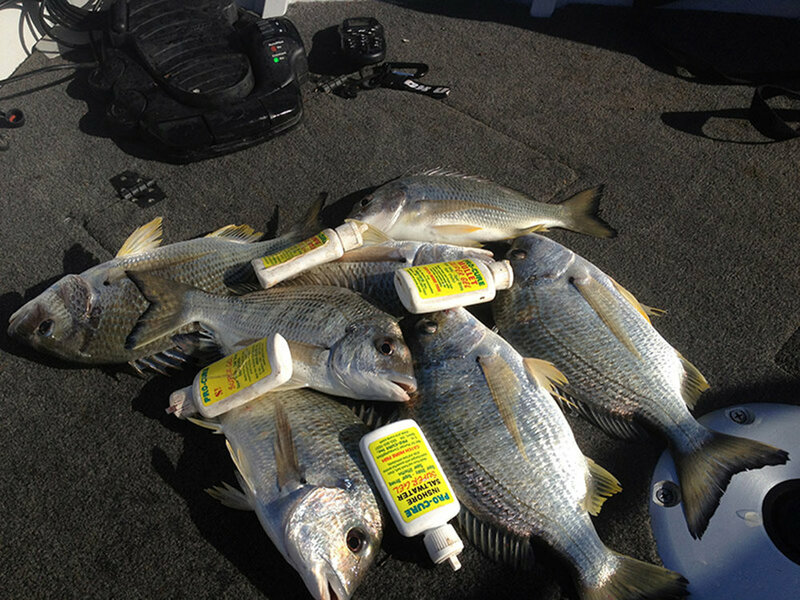 Nowadays lure fishing is the most popular type of fishing throughout Australia, with just about every tackle store stocking a wide variety of different lures. Soft plastics, blades, hard bodies, spinnerbaits, ice jigs, poppers - the list goes on! And although they all work for different species in different applications, they can all be made even more effective with the addition of a scent or bite stimulant. Bait scents not only make your lure smell good to the fish, they also taste good to fish, making your catch rate sky rocket. When a fish grabs your lure without scent on it and they don't find the hooks, they will rarely come back for a second look. When a fish grabs your lure with bait scent on it, they keep eating it until either every last bit of scent has been sucked off it, or until they find a hook stuck in the side of their mouth. Although there are many different types of scents on the market, there is one that stands out well above the rest for me, for many different reasons and that is Pro-Cure Super Gel.? Pro-Cure Super Gel is actually made from real ground bait. What a perfect scenario for a fish when they see a lure that looks real and it also smells and tastes like the real thing.? Most brands of scents that I've used over the years normally only have one flavour of scent in their range. With Pro-Cure this is not the case as they have nine different flavours that are all pumped with supercharged amino acids, bite stimulants and are UV enhanced. The flavours are Garlic Plus, Bloody Tuna, Blue Crab, Mullet, Squid, Inshore Saltwater, Shrimp, Nightcrawler and Crawfish, all of which have been extremely successful across a massive range of species. By having such a wide range of flavours it means that you have the ability to match your lure of choice with one of Pro-Cure's nine flavours, to better your chance of catching the species of fish you are targeting. I always carry a few different flavours with me when I go fishing as what fish are eating can vary from day to day. I honestly think that you can't put a better presentation in front of fish than something that looks, smells and taste like the real thing! And with ZMan's 10X Tough ElaZtech you won't be continually buying and replacing baits. For example a ZMan SwimmerZ alone is a perfect mullet imitation, but once loaded with Mullet Pro-Cure Super Gel what chance does a fish honestly have? A prawn or crayfish imitation loaded with either Shrimp or Crawfish Pro-Cure is also unstoppable, with the endless options right throughout the Pro-Cure range. Pro-Cure is not only intended for use on soft plastics, it is also as effective on hard body lures, blades, poppers, spinnerbaits, in fact any style of artificial bait can be made more appealing to fish with the application of a bit of procure. Coming in a pocket size bottle with an easy application nozzle, Pro-Cure is mess free and extremely easy to apply. Personally I like to give the whole lure a generous coating and I reapply after roughly 8-10 casts or after a fish is caught. Although Pro-Cure has a gel consistency that sticks for quite a long time, I find the more often you reapply the more you improve your catch rate. When a soft plastic has a belly slot or cavity I like to fill it with Pro-Cure as much as possible as I find it stays inside the cavity for a very long time. For those people lucky enough to have a boat, the best way to keep your range of scents is to attach a small Velcro dot on the back of your tube with another Velcro dot on the inside of your boat. By sticking all of your bottles upside down with the nozzle closed it will ensure that even when your bottle is close to empty your Pro-Cure will always be ready to come out of the nozzle and also keep the bottles off the deck of your boat. I'm renowned for leaving bottles lying around with the nozzle open and there's nothing worse than stomping on a full bottle and having it squirt out all over your carpet.? Most tackle retailers stock a good range of Pro-Cure and it is a must in your tackle box if you are serious about bettering your catch rate whilst lure fishing. Remember to always carry a few different flavours so you can match the scent with your lure choice or target species. Next time you are at your local tackle shop be sure to grab some Pro-Cure Super Gel to give yourself that unfair advantage. 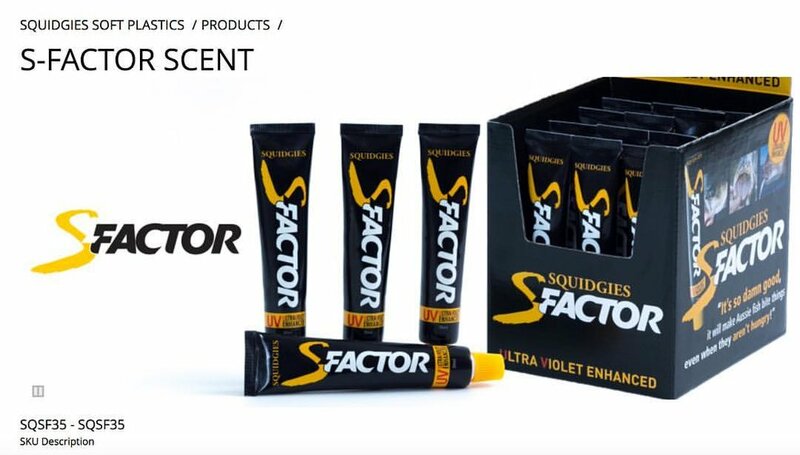 Engineered after years of research by a marine biologist working on Australian fresh and saltwater species, S-Factor combines a complex matrix of amino acids and salts PROVEN to attract, excite and stimulate predatory fish. S-Factor makes fish bite and encourages them to hold on longer! Use S-Factor on all soft and hard lures, jigs, squid jigs, flies….. even natural baits!!!! !